Who's got the least amount of patience for tools of them all? Shirayuki was never one to let others tell her how to run things. A beautiful young girl who happens to be lauded near and far for her adorning striking red hair, she prefers to utilize her talents and knowledge with medicinal plants to help ailing townspeople. Much to her chagrin, however, those tempting tresses soon grab the attention of Raji, a childish prince who decides to scout/claim Shirayuki as his own concubine. Deciding to have no part of that anytime soon, Shirayuki hurriedly cuts her hair and runs off to the neighboring kingdom, where she soon comes across local prince and his two traveling aids. Soon befriending the prince by utilizing her medicinal knowledge to tend his wounds, she accompanies the trio across the kingdom of Clarines, where she peruses her ambition of being a court pharmacist as both challenges and feelings alike escalate. Too sweet for your blood? Ok, so maybe at an initial synopsis the show seems as narratively blasé as your next shiny romcom, but just give the show ten minutes and you see a lovely, very Disneyesque show about a young girl beating out the forces surrounding her that simply won’t allow her to accomplish Shirayuki’s aspirations on Shirayiki’s dime. As is implied in the synopsis, she’s characterized as an intelligent, tactile girl that values herself and sense of identity above what others think of her. She’s a strong women who regularly uses her wits to overcome obstacles while still embracing feminine characteristics (being physically weaker than some men, liking a dude a lot, and the like), which is too often neglected in stories outside of Disney and the like. And if you really like that stuff, well, let’s just say that by episode 2, that characterization comes in super strong. That’s not to say that our princely folk isn’t equally as fun to follow around! Zen is a tactile learner who loves to be among his people (and is often seen shrugging off duties for the sake of a jaunt around town). Not one to be easily swayed, he doesn’t trust this newcomer into his kingdom upon their first meeting, and only through her willingness to utilize herself and self-confidence is she eventually able to gain his trust and friendship. Through their various surrounding challenges in plot (which can be fairly engaging in itself. I mean, seeing the outside world react to their relationship deserves a whole discussion in itself) they grow and learn about each other. 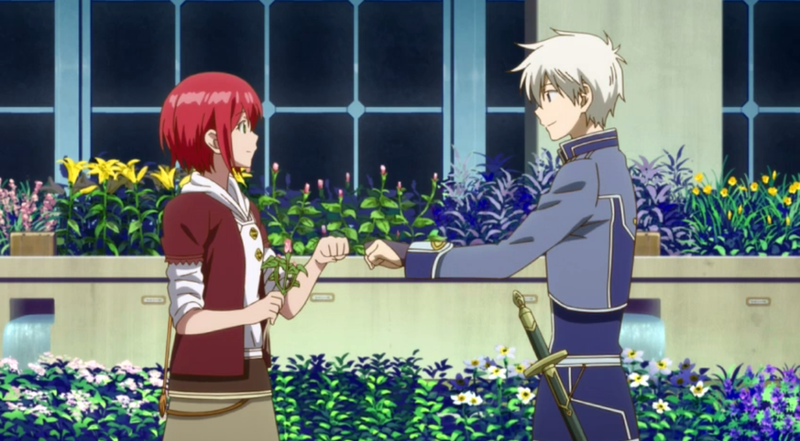 Through it all, Zen stays admirable in his cool and stoic defense of Shirayuki while she does her own part in striving for an equal relationship. Aesthetically, the comparisons to Disney just kinda eviscerate themselves. From the brightly lit, close contact scenes of romantic tension sprinkled in the show and intro to the flighty orchestration, intricate castle designs and pastoral setting, she show brings to mind just as much Beauty and the Beast as Ore Monogatari. Being a cute, admirable romance with characters that are engaging and well-coordinated to the narrative, this show serves just as well as a viewing for your next girls night in to a couch gathering with family of all ages. Episodes watched at the time of writing: 7/8 released. Rachael’s a student at a Florida university that frolics regularly in Disney parks and has an entirely too extensive collection of stuffed animals. If you wanna follow her other random musings on cartoons (or just stop by to say hi) there’s her blog, <ahref=”https://lotsofframes.wordpress.com/”>https://lotsofframes.wordpress.com/.